How I have managed to keep this little bath bomb for so long I do not know. Released back in 2013 the Bombardino bath bomb was a product from my first ever experience of a lush Christmas. 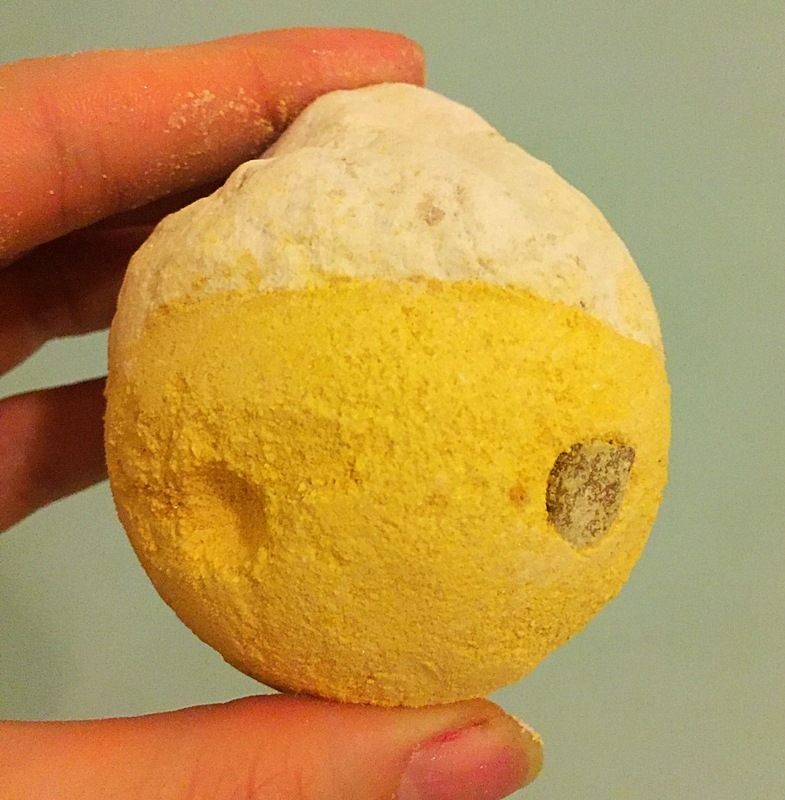 It’s safe to say that this bath bomb does look a little worse for wear now but I was surprised to find that it still smelt wonderful and had a surpringly large amount of fizz left. This bath bomb was only £2.50 back in 2013 making it great value of money. About the same size as a butterball bath bomb the Bombardino bath bomb is a lot smaller than your average ballistic. 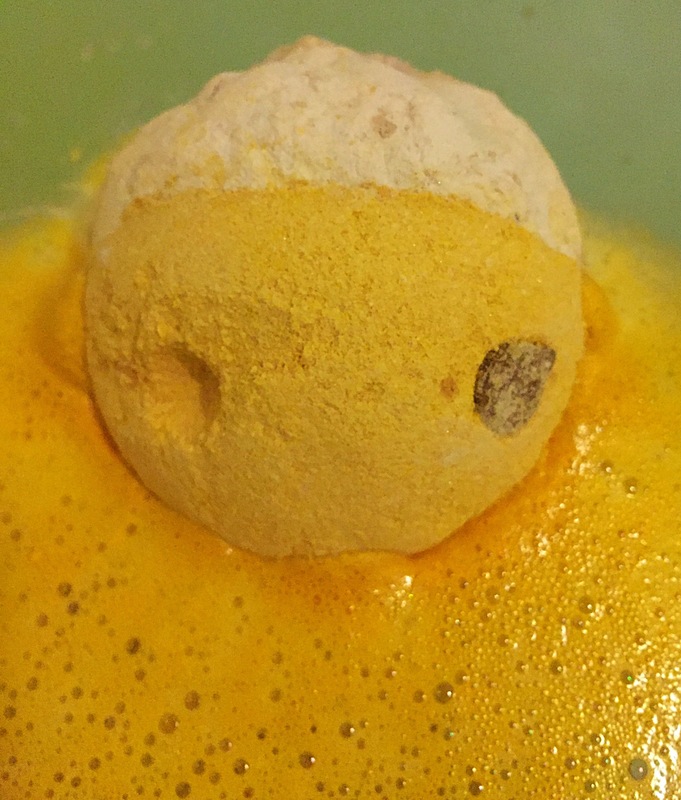 Containing bergamot oil, Sicilian lemon oil and vanilla absolute, the Bombardino bath bomb was inspired by a popular Italian drink of the same name. 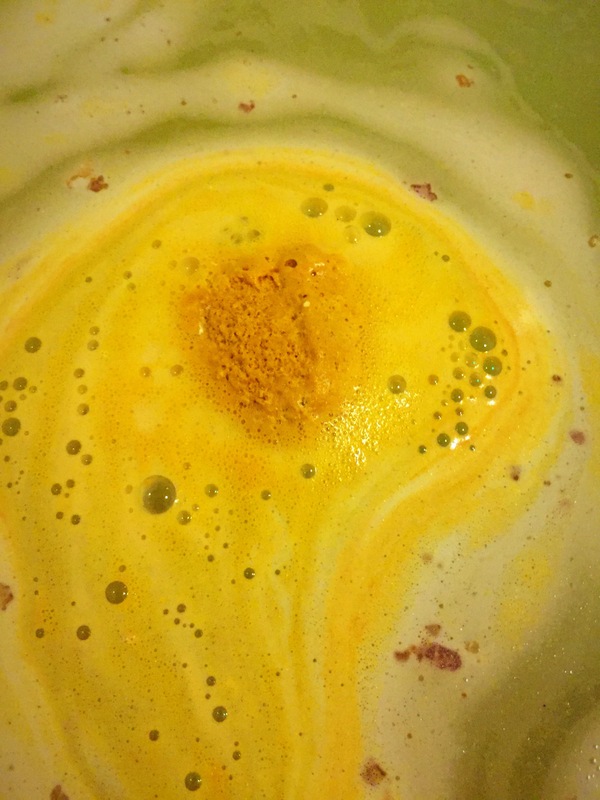 I found this bath bomb to have a very creamy aroma with a citrusy lemony twist. It is defiantly a very rich aroma that is very comforting and relaxing and I can see how it represents the winter drink it’s named after. Design wise the Bombardino bath bomb looks like a little tiny face and comes complete with two vegan friendly chocolate eyes ( however my little one was missing an eye). Once popped in the water this bath bomb is quite a slow fizzer. As it fizzes away it releases swirls of yellow and white foam across the surface of the water. Inside the bath bomb is a very good helping of cocoa butter. 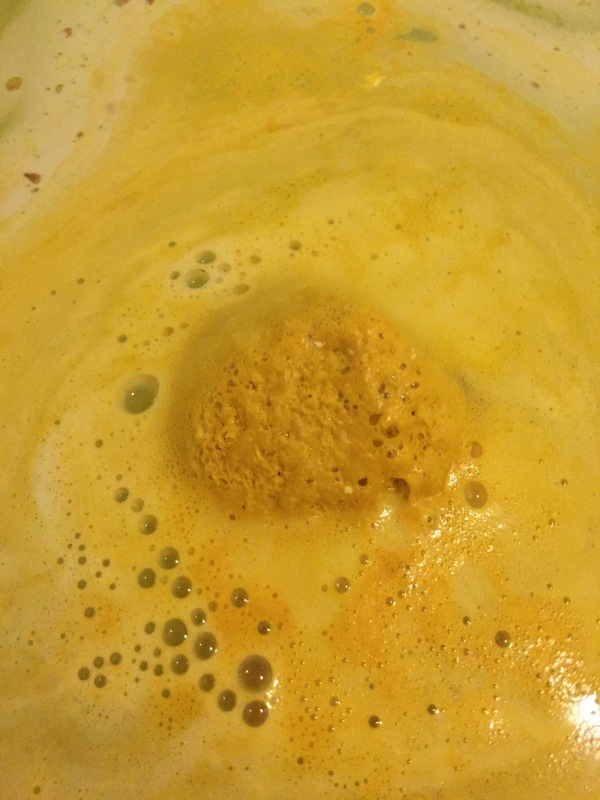 As the bath bomb dissolves the butter melts leaving droplets of oil across the surface of the water. This element makes this Bombardino very similar to the butterball bath bomb. I found the inclusion of the butter made this it extremely moisttuiding. After use I found my skin super soft and I didn’t need to use any lotion at all. Overall I love this little Bombardino bath bomb! I love its cute design and it’s lovely gentle scent. I’m keeping my fingers crossed that I might make an appearance in the kitchen this Christmas. INGREDIENTS: Sodium Bicarbonate, Citric Acid, Cocoa Butter, Soya Milk Powder, Perfume, Radiant Gold Lustre, Bergamot Oil, Sicilian Lemon Oil, Fair Trade Vanilla Absolute, Cornflour, Sodium Laureth Sulfate, Titanium Dioxide, Gardenia Extract, Limonene, Linalool, Colour 19140:1, Colour 19140, Snowflake Lustre, Dairy Free Chocolate Drops.